What’s the best way to ‘Get In’ to the BBC? 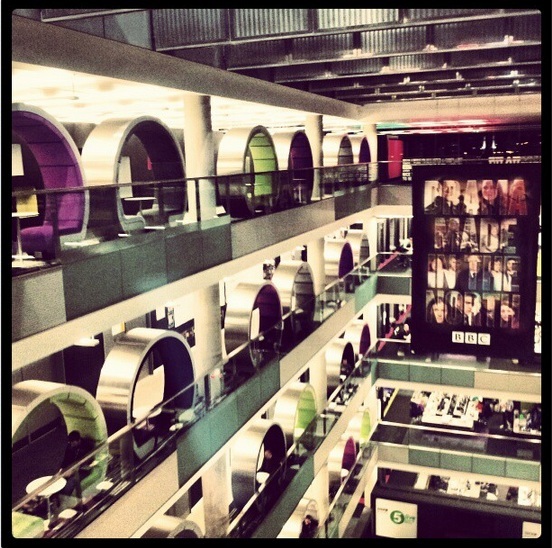 The BBC’s Journalism Trainee Scheme and Production Talent Pool attract hundreds of applications for their schemes every year. Understandably, it’s incredibly competitive. The process, which involves an application, verbal reasoning test, assessment centres and interviews, is rigorous. They will ask you about your knowledge of the BBC, ask you to pitch programme ideas, and make suggestions for how to reach out to new, different audiences. For those who succeed, with the JTS you will get to experience a year-long job with the Beeb, with training in online, print and broadcast journalism, and the PTP will give you opportunities to complete paid placements for the company and then go onto apply for the Production Trainee Scheme. Both opportunities give the chance to travel, work on a variety of projects and mediums, and get a whole host of training and experience. You’ll also get mentored by a professional BBC journalist. Are you dreaming? Nope. Media City is a mind-melt. With the majority of the buildings in Salford just opened last year, the area feels a bit like a new campus university, but with a billion pound budget. A huge piazza/deck area complete with wide-screen TV showing BBC News channel sits on the edge of a collection of glass high-rise towers. Each one is filled with bright colourful architecture and a range of captivating displays, overlooking the city of Manchester in the distance. Name tags are my favourite part of events such as these; only a lanyard could have made me happier. As we pinned them to our chests we peered through the glass into the BBC Sport office of the ground floor, the boys slightly more interested than me. I was more curious (and relieved) to see the employee nearest the window chomping on his Tesco lunch whilst catching up on the latest match results. Nice to see working at the BBC doesn’t mean you can’t be down to earth too. We were escorted to the seventh floor, and ushered into a side room. Simon Wright introduced a panel of four successful applicants to both schemes, and asked them a range of questions about their experiences before opening them to the floor. After watching a film made by the trainees about their experience with the scheme, Chris Walton currently heading up Digital and Social Media training. He spoke about the importance of social media, primarily in the news department of the organisation. With 5000 emails sent to the BBC everyday, it is important to engage in social media for a variety of reasons. Primarily, this is for promotion of its materials to the public, but it is also used for news-gathering and finding information and case studies quicker than ever could be done through conventional media. He demonstrated the importance of this through a film on news journalism, focusing on examples from the past decade such as the Christchurch earthquake in 2011, and the Tehran uprising of 2009. Interviewing a range of BBC journalists, they concluded that social media had transformed the way that they do journalism. It saves time, helps build communities and allows journalists to work collaboratively with the public to get an accurate picture of what is happening. Chris Walton didn’t just rely on the ‘traditional’ social media (if that’s a term) such as Facebook and Twitter, but also noted the importance rise of websites such as Pinterest, Tumblr, Storify and Instagram, which are building more and more regular users by the week. However, as many good points, there are also limitations to the reliance on social and new media. Twitter, he noted, breaks most news stories today. However, the importance of reliable sources and getting the information first plays a constant conflict, intensified by social media. The BBC has always promoted their policy to not name any specifics unless it had been officially quoted. Even then, sometimes they still get it wrong. With the rise of social media, verifying your sources has never been more crucial. Social media has also harboured the development of the 24 hour news cycle. In this sense, it is crucial to keep social media manned at all times, in case of a sudden event that needs an immediate response. It also is necessary to differentiate the personal from the professional in terms of Twitter. I recently met journalist and lawyer David X, who recommended separate accounts for the two, which is a policy the BBC advocates for some of its staff. Would you say it on the radio? If not, don’t say it online. He also recommends you to be careful about what you retweet, as it could be seen as endorsing the views expressed. In the next break we popped into the room opposite for a cuppa. 50p for tea? That’s as cheap as Parliament, a definite tick from me. The activity I benefited most from was the production pitch exercise. We split ourselves into groups and interviewed one of our peers, with the result of turning that conversation into a pitch for a new programme. We were to construct the idea, the genre, slot, and discuss a question it would answer, and a journey we would take our viewers on. As someone with a limited knowledge of this form of production, it was immensely helpful to discuss, and was very challenging to formulate a unique pitch in just half an hour. The final hour was spent offering tips and advice to those applying for both schemes which included how to best use your experience, constructing your story application and the importance of creativity and innovative ideas. Simon Wright, Lou Gallagher and Kate Hoyland had these tips for your applications. – Creativity and ideas. Write eloquently, and interestingly, but don’t use ‘big business words’. Try to tell a story, make it compelling and clear. Don’t start every sentence with I, vary your structure. Let your passion shine through, and come up with different, original ideas to highlight this. – Experience. Show this well by writing about what you’re proud of. Use details and examples of your role, and explain what it showed. Describe the transferable skills you learnt, and how you can apply them elsewhere. – Humour. There’s no need to be serious – use your imagination. Lighten up, and engage with it. Keep it real. – Flexibility. You must be prepared to apply yourself fully to any situation, and go anywhere. If you’re interested in a specific genre, you can mention it, but don’t let it limit your options. Emphasise your multi-skilled attitudes, and try everything. – Focus. Read the question, and answer it properly. Give the answers that best answer it. Read your answers over, and check for correct spelling and grammar. Get to the point, but don’t list your answers. – Being conventional. Don’t talk about your gap year or being a student – it’s not original, and they get it alllll the time. – Sending a headshot. Why? There’s just no point, you’re not going to get in based on your looks. – Lying and exaggeration. It’s clear when you’re exaggerating your experience, and they will pick you up on it. Blatant lying is going to get you asked about and will be found out. – Getting names/titles wrong. Research the people you’re applying to. Check if their titles should be male or female. Nothing puts you off more than getting an email starting ‘Dear Student’, so why should you expect ‘Dear BBC Trainee Scheme’, to get you further? – Poor spelling and grammar. This is a huge pet peeve for people in the media industry and beyond. The odd slip up won’t count too much against you, but saying you have a ‘keen eye for deetail’ won’t go down too well. If you’re successful, you’ll go through to an assessment centre stage. This will involve group exercises with situational judgement tests. It could be anything from a Friday night entertainment TV pitch, to organising a radio chat show phone interview. It might sound like a daunting process, but if you’re dedicated to a career in the media, this won’t put you off. If you don’t apply, you’ve got no chance. At the Get In event there were applicants who had tried multiple times already, and still up for trying again. Don’t talk yourself out of it, and give it a go – if you have the passion and the drive, you are the strongest candidate. We were then ushered downstairs and out of the building, (not before I took a few pictures and caught one of the organisers to arrange an interview) to brace the ferocious winds of Manchester and the M6 once more. While I didn’t particularly learn much new information that I hadn’t already come across, the experience was very positive. It was useful to meet those who were involved in running the scheme, and ask questions to those who were successful applicants. The brief walk around Media City was motivational (Costa in the building next to Quay House, yes!) and overall it was an interesting and engaging afternoon that couldn’t have been better spent procrastinating over my dissertation. Thanks for sharing such an informative piece into the BBC’s Journalism Trainee Scheme. I have submitted my initial application, and await to hear from the sectors. My backstory, I believe, meets all the criteria for being a potential candidate for the program, as such, I am excited about joining the BBC through this portal. Writing of various kinds has been my passion since my teens, and at the young age of 51, I have many milestones behind me in my writing career. My first published article was in the Dominica Chronicle back in 1981. Consequently, my articles, poems short stories and letters to the editor have appeared in all the local papers in Dominica. Along the way, i have also published three books of poetry, a book of short stories and a non fiction book on the Rastafarians of Dominica. I also had a short stint as a full-time reporter with The Chronicle (2002-2004) following the granting of a diploma from the Harcourt Direct in 2002. Another highlight of my amateur career, was the hosting of the Dominica Writers’ Guild hour-long, radio program, ‘Review’ which I produced and presented. Being a journalist, (particularly broadcast) has long been a dream of mine. If I am successful with this scheme, I believe that I would have a lot to offer the BBC. I look forward to sharing my story with others if this becomes the case. what journalism-related experience did you have or do you think that it’s important you have something outstanding ? Also, what can I do to increase my chances of getting accepted in the JTS?